Today we are delighted to announce that the team at Winnow have been shortlisted for the award for Circular Economy Tech Disruptor at The Circulars. Being recognised by this prestigious organisation is validation for the impact that both our team, and more importantly the thousands of chefs using Winnow around the world are having on the problem of food waste. The Circulars is an initiative of the World Economic Forum and the Forum of Young Global Leaders. It is widely regarded as the world’s premier circular economy award program. The award offers recognition to individuals and organizations across the globe that are making notable contributions to the circular economy in the private sector, public sector and society. The awards will be hosted at the World Economic Forum’s Annual Meeting in Davos in 2018. Food waste is a significant global problem with over ⅓ of all food produced eventually going to waste. 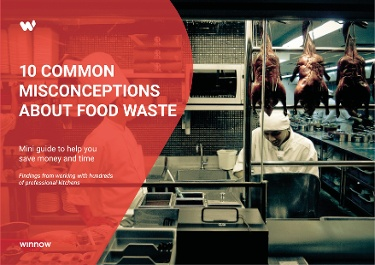 In the hospitality sector we estimate that around $100bn worth of food is wasted in commercial kitchens every year. The circular economy is an alternative to a traditional linear economy (make, use, dispose) in which we keep resources in use for as long as possible, extract the maximum value from them whilst in use, then recover and regenerate products and materials at the end of each service life. One of the core principles of the circular economy is to preserve and enhance natural capital which is reflected in our approach to using data to minimise overproduction in commercial kitchens. We work with large kitchens in environments like staff restaurants, hotels, universities, cruise ships and quick service restaurants. We have found that by giving chefs digital tools to quickly and easily measure waste combined with analytics to pinpoint opportunities to reduce waste can consistently cut food waste in half over 12 months. Today Winnow is operating in almost 30 countries and trusted by brands like Compass Group, Accor Hotels and IKEA, however we are really just at the beginning of wholescale system change. Early adopters are already reaping the benefits of using new technology to run more profitable, sustainable kitchens. We would challenge the rest of the hospitality sector to look inside their own businesses to identify similar opportunities to embed circular economy principles to drive efficiencies whilst doing the right thing at the same time.